HD Department Store Customer Return Loads. Manifested & Sold as a % of Wholesale Value. Lots are classified as Appliances, Blinds, Doors & Windows, Flooring & Rugs, Hardware/Tools; Kitchen & Bath; Lighting & Ceiling Fans, Plumbing & Mixed Loads. All loads typically offer an assortment of items & price points. Each Pallet Lot has approximately $3,000 of Retail Value. 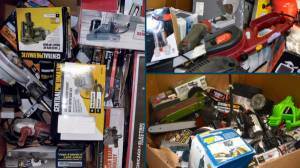 Lots typically include: Miter saws, nail/stapler kits, drills, air compressors, air tools, hammer drills, assorted power & hand tools, welding kits, wrenches, sanders, cement mixers, welding masks, Generators, Gas Auger Drills, Water Pumps, Pressure Washers & more. Some Loads may be heavier in or exclusively made up of Gas powered items. Typically Available as 5 pallet LTL Lots or 25 Pallet Truckloads. Custom Built Containers to Maximize Value Available - please inquire with your Account Manager. Sold as a % of Retail Value. 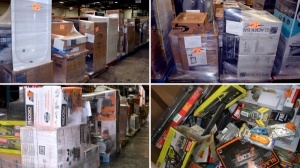 Loads typically include: Miter saws, nail/stapler kits, drills, air compressors, air tools, hammer drills, assorted power & hand tools, welding kits, wrenches, sanders, cement mixers, welding masks, Generators, Gas Auger Drills, Water Pumps, Pressure Washers & more. Each Bin has approximately $1,500 of Retail Value. Sold at a flat price per Bin.